The goal in drafting a successful fantasy football team is to select a lineup that creates the most value. I talk about this concept a lot throughout The Late Round Quarterback. It’s easily my favorite word to describe logical, sound fantasy football selections. Joe Bryant created a system a while back that is now referenced by fantasy analysts all over the Net. He coined it “Value Based Drafting”, or VBD for short. And it makes sense. I mean, this is what value is: relative worth. We don’t see Aaron Rodgers as a valuable quarterback in fantasy football simply because he scores the most points. We see him as valuable to the game because he is much better than the rest of the players at his position. We should be concerned about how a particular player is performing compared to the rest of his position, not how that particular player is performing compared to all positions. That, in a nutshell, is what VBD speaks to. But this, ladies and gentlemen, is where people stop their analyses. 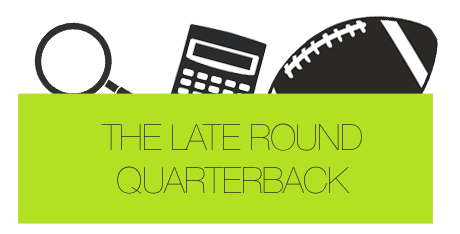 You’ll notice that the growing trend in fantasy football is to draft a quarterback early, because, based on VBD, quarterbacks are now the most valuable position. The difference in points between Aaron Rodgers to the worst starting quarterback in your league last year was larger than the difference between Ray Rice and the worst starting running back in your league. Running backs, according to many experts, are becoming more and more obsolete because of this. It all seems very reasonable. If you have the biggest difference maker at a position, then you should have the most valuable team. And if you have the most valuable team, then you should have the best shot at winning, right? Well, the second part of that is true. The first, regrettably, is not. Even if the point total of Aaron Rodgers to his position is greater than Ray Rice to his, it doesn’t mean Rodgers is more valuable. And it’s the reason VBD is flawed. Let’s introduce an addition to the old idea. I’ll call it VBDv2. The MVP of fantasy football is the player who is far and away the best at his position. He scores more points compared to the rest of the guys at his position than anyone else. In today’s world, let’s pretend that this guy is Aaron Rodgers. Remember, this is what experts are telling us all to do – to draft an elite quarterback early. Ideally, this quarterback would be Aaron Rodgers. Aaron Rodgers is being drafted, on average, in the early to mid first round of most drafts using standard scoring. And moreover, the 12th ranked quarterback in a 12-team league is being drafted in Round 8. This 12th ranked quarterback is the hypothetical worst starting fantasy quarterback in the league. If the difference between Aaron Rodgers and the 12th quarterback drafted (or the worst starting quarterback in your league) is X, then you would expect to lose X/8 points at each quarterback rank, or pick, in a draft. Another way to put this: X points are being spread across 8 rounds of your fantasy draft at the quarterback position. Looking at running backs, we can conclude that Arian Foster, the top ranked running back in 2012, is Y amount of projected points better than the 24th ranked back. Remember, if you’re in a 12-team league, your league is more than likely starting at least 24 running backs in a given week. When that 24th ranked running back is being drafted in round 5, then we would expect to lose Y/5 points at each running back rank, or pick, in a draft. Again, another way of wording this is to say that Y points are being extended through 5 rounds of a fantasy draft. We now have two formulas: X/8 and Y/5. These formulas represent the number of points lost at each round of a fantasy draft until all starters at a particular position are drafted. Let’s plug in some numbers. Currently, according to ESPN, Aaron Rodgers is expected to score 146 (381-235) points more than the 12th ranked quarterback, Ben Roethlisberger. If Big Ben goes in round 8 of a 12-team draft, which is his expected position, then you’d be losing 18.25 points each round at quarterback. At running back, Arian Foster is projected to score 296 points. That’s 152 points more than Jonathan Stewart (296-144). With the round and formula in place, we’d expect to lose 31.2 points each round at running back until all 24 backs are chosen. You would think so, but history tells us otherwise. Yes, Aaron Rodgers has consistently and historically been a top quarterback, and we’d expect him to do the same this year. But since 2006, the overall probability that a quarterback in the top-12, -6, and -3 pre-season rankings finishes in the same rank category at season’s end is no different than a running back in the top-24, -12, and -6 pre-season rankings finishing with the same or better expected rank. In other words, the running back and quarterback positions are equally inconsistent. If you don’t believe me, then buy my book. I’ll prove it to you. The fact is, people aren’t analyzing rankings from 2008 to make their decisions in a 2012 draft. We’re looking at rankings for 2012, and making draft choices based on them. We all need to analyze players using VBDv2 on a case-by-case basis. If you have the 11th pick in a 12-team draft, and not a single quarterback has been taken, then yes, you should draft Rodgers. And inversely, if everyone is drafting quarterbacks during the front end of the first round, you should most definitely snag a guy like Ray Rice or Arian Foster with your pick. The fact, however, is that the majority of your fantasy leagues are going to be basing their draft decisions on rankings from websites, magazines and books. And when each of these are fairly similar, the rounds these players are taken don’t fluctuate all that much. In my analysis with all of these posts, and even in my book, I’m not concluding that Aaron Rodgers is a bad draft choice at any point in the draft. Heck, I think he will become the best quarterback in fantasy football history. I’m saying that Aaron Rodgers, being drafted in the mid to early first round, isn’t worth the pick. He only becomes worthwhile towards the end of the first round of your draft.